This short tutorial will familiarize you with more options for modifying an ImarisVantage plot. You may watch the tutorial video (click to enlarge) or read through the instructions further below. 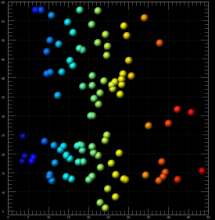 Following the plot’s creation, objects’ size and orientation are automatically determined to provide the optimal plot display. 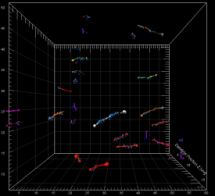 This is determined by the number of selected plot dimensions, the values of the chosen statistical variables and the number of objects being visualized. 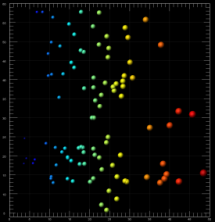 The size of an object in an ImarisVantage plot can be altered using the Minus and Plus buttons. 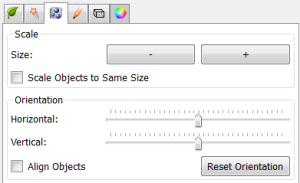 Pressing these buttons changes the objects’ size within the View Area, by simultaneously changing the Scale values for the X, Y and Z dimensions of the plot. Every time the Minus button is pressed the size of the object is reduced by 10%. Similarly, by using the Plus button, the objects are enlarged by 10%. 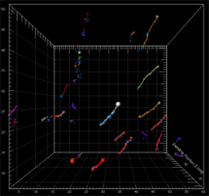 There are several options that affect how objects are oriented in an ImarisVantage plot. You can manipulate the object by rotating it and thus changing its initial axial position. These options allow you quickly to change the viewing orientation of an object, making it possible to view it from all sides. To rotate the objects either horizontally or vertically you can use the respective sliders. 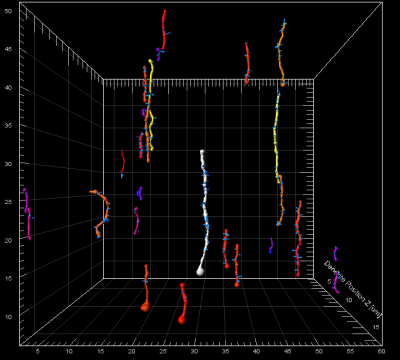 Effects of rotation are shown in Fig. 4 & Fig. 5 below.